Few people truly appreciate the awe-inspiring beauty that the British countryside has to offer, and the best way to experience it is by getting out there and seeing it for yourself. The best driving roads in Wales are surrounded by some of nature’s finest creations, featuring sweeping s-turns and hair pin bends to provide the ultimate driving experience. As the market leader in Car Finance in Wales, it only felt right that we asked Smile Car Finance to help us conduct this list. Elan valley is easily one of the most beautiful areas in Britain, it’s known as the Welsh Lake District and features five huge dams with a road hewn into the craggy hillside running beside the tranquillity of the lakes. These dams, however, had a spectacular use; they were training aids for the legendary Dam Busters raid in Germany. The stretch of road leading away from Craig Goch ranks in the list of most challenging roads you’ll find anywhere in Britain. There are tight hairpins and open, well-sighted bends. It goes uphill and down. There are challenging chambers and blind crests. In short, it’s a driver’s delight. The Brecon Beacons is home to some of Wales’ best driving roads, and none can beat the Black Mountain Road. Since Jeremy Clarkson put a Mercedes Benz SLK 63 AMG through its paces there, the road has been dubbed the Top Gear Road. The route is now popular with test drivers, bikers and the occasional kamikaze sheep and it’s easy to see why. With over 80 corners in just a 20 mile pass it’s a full body workout to keep yourself in the seat and the car on the road and it’s worth it. It’s narrow, really twisty and very scenic. 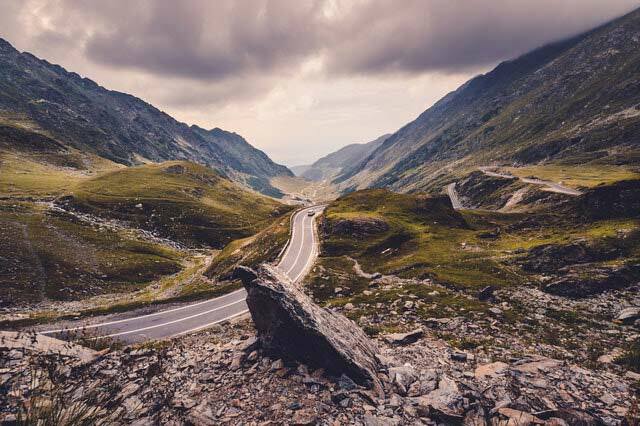 The road climbs up the Abergwesyn Pass – up the perilous Devil’s Staircase and through dense conifer forests to miles of wide, desolate valleys where sheep graze unhurriedly. The Devil’s Staircase is a set of bends, with some 25 per cent gradients thrown in to keep it interesting, before a fairly level section across some empty hillside and forest, where another steep descent reveals the other side of the hill. The A44 is famous for all the wrong reasons, it’s officially the most dangerous road in Wales due to the staggering number of accidents there every year. Really, it should be known for its natural beauty and the excellent driving experience it provides. Smooth surfaces see quick sweeping corners clinging onto the terrain while busy chicanes send you into a trance-like state. These views, despite how amazing, are believed to be a factor in a lot of these crashes so you need to ensure you keep your eyes on the road! The Evo Triangle name comes from the writers at EVO Magazine, this is the chosen route for them to test drive the cars for their magazine features. The route is extremely popular with thrill-seeking motorists sparking a retaliation from the local police force, who’ve started a crackdown on excessive speeding and anti-social behaviour on this hugely popular Welsh Road. Despite their efforts, both car and motorbike drivers still flock to the area to attempt to complete the famous circuit.